These are lyrics by Culture Club that we think are kind of repetitive. 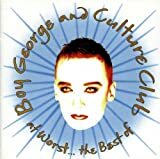 Culture Club's, "Do You Really Want To Hurt Me?" No, I don't want to hurt you, but I might have to if you don't give it a rest! Culture Club's, "I'll Tumble For Ya"
Judging by this cheesy lyric it seems like he'll tumble for anybody. Culture Club's, "Miss Me Blind"